Attention Jets Fans of New York and New Jersey: now through February 6, ZinBurger in Clifton is featuring the "Jet Fuel" Burger. Even though the Jets lost the AFC Championship game this past Sunday, the folks at ZinBurger wanted to offer fans a way to show their support for the Jets' valiant effort. 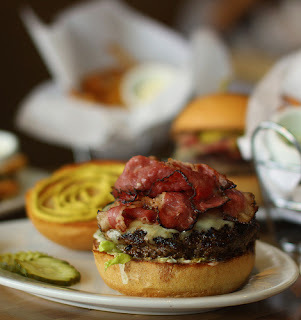 The Jet Fuel Burger is comprised of all New York ingredients: certified Angus beef, topped with 1000 Islands Mean-N-Nasty Cheddar, Gulden's Mustard, New York Pastrami, lettuce and mayonnaise, The burger is cooked to order on a griddle in its own juices and served on lightly buttered, brioche style bun. ZinBurger is located in the Promenade Shops at Clifton, 850 Rt 3 West, Clifton, NJ, 973-272-1492.